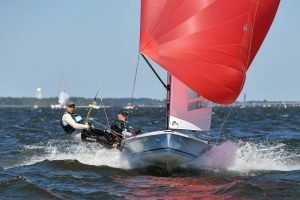 Now that the dust has settled from the Worlds in Annapolis, I got a chance to catch up with the world champion himself Mike Holt, who was kind enough to answer a few questions. Mike and Carl won with a 2- 1- - 5- 3- 1- 3- , which was the most consistent score line of the event. The variety of light air days and windy days made this especially impressive. I wanted to learn more about his sailing career, and what goes into making the success he has created for himself. Q: Congratulations on your third world championship! How are you feeling now? A: Thanks, it was a great feeling to win an event that no one expected us to win! To win amongst such a good group of sailors and lifelong friends was a big moment that will live will Carl and I for the rest of our lives! A: So many people! Sailing 5O5’s has been such a journey and to be at the stage we are now is just incredible. 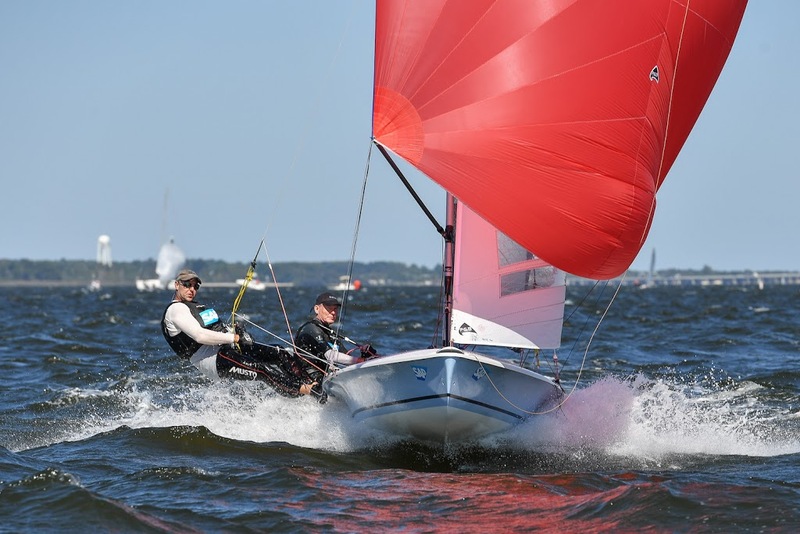 When I started sailing the boat, the people to aspire to be were Peter Colclough and Krister Bergstrom and the first Worlds I did they were 1 and 2 and I thought wow, to race at that level and be match racing for a World title, how cool is that! The class has such an unbelievable history of great sailors, right from the start up to the current day, that it is continually motivating and inspiring to continue the legacy that they have built. Q: You have been in the class for awhile now, but really stepped it up a notch over the past decade, starting with your 2nd place finish in the 2009 Worlds. Was there a critical moment in your career where things just “clicked” for you? A: Sailing for me has been two distinct parts, before kids, when I sailed all the time and did what I wanted to, then once the kids had grown a bit and were less dependent came the second sailing career. Back in 2008 Carl and I sat down and decided that it was time to raise our game and invest in our sailing. We decided to limit the variables, put together the best program, practice and see if we were as good as we thought we were! Put up or shut up time! At that time, we felt the best kit was a Rondar hull, M2 mast, Watertat foils (480 board) and for the SF ’09 Worlds Glaser sails. So, we got a new Rondar hull and I fitted it out with the help of Shane Illidge and straight away we were on the pace. Having the best gear and racing for a World title (we had 2 goes at winning as with 2 races to go the worst we could finish was 2nd) against Mike and Jeff was so much fun that I think we were addicted to the thrill of competing at that level. Two years later we came even closer in Hamilton Island, coulda, shoulda… So then it became an obsession. That was fueled further by coming 4th to 3 German teams in Barbados, now it was an obsession magnified by passion! Q: You have a strong preference to gate early at the start? Can you explain why? A: That is easy, if you think you are fast, you want to be leveraging your speed advantage straight away. However, we always track the wind and the discussion in the boat is, “do we want to be the rabbit?” If we do, we will start late, or at least until we feel the rabbit is headed, then we start. Otherwise, get racing and get to the first shift. Q: Watching the video, you are a very physical sailor. Have you always been this way? A: Yes! Long list of crews who will complain about how hard it is to stand on the rail when I am driving. But it is condition specific, you need to go through the gears with the wind and sea state. When it is light it is a smooth, gentle touch game, that evolves as the wind increases until when it is windy it is all about keeping the boat on its feet and moving as fast as it will at all times. Q: What type of physical and mental preparation do you do to prepare for a world championship? A: The training is simple but hard, tons of hills on my bike, then 20 minutes a day on the rowing machine. You have to be able to race at 100% all day long. Every day. Mentally, I lie to Mike Martin about our weight… The thing is, the more time you invest and the better the results get the easier it becomes, obvious in retrospect but as the saying goes the more I practice the luckier I get. Q: What did you do differently to prepare for this event? A: Nothing. Every event could be any conditions, except SF, where you know it will be windy. I thought Kiel in ’14 would be light, it was windy, I thought Weymouth would be light it was generally windy, so I figured that to optimize like we did for Weymouth would turn out to be counter productive. 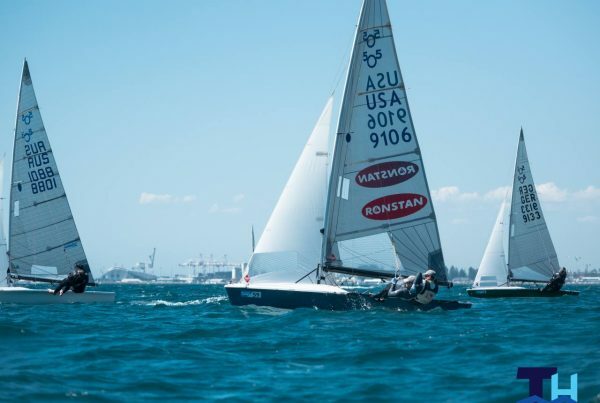 So we just did plenty of sailing, well I did, Carl was a bit more constrained, but me, Rob/Carl did 4 weeks of events around the World before the Worlds so plenty of time sailing and really were focused on being fast regardless of the wind. Q: What does a typical practice day look like? A: Those are all long in the past, now it is a day or two sailing before an event if everything works out. We are lucky that on the West Coast we have Mike, Howie, Ted and many other great sailors to be pushed by, every time we go sailing and when we get to Europe we have Ian Pinnel and Andy Smith who push us. So practice is lining up before racing. Lining up and dialing in the boat speed. Test the numbers and the fastest way around the race track so that at the start gun we have a good plan in place for what we want to do. You have to use the time as effectively as you can. On a race day, get out in plenty of time, get the boat set up, learn what the wind and tide are doing, confirm your plan for the race. Execute. Q: Carl lives on the other side of the country and you prefer to sail with him. What does Carl do best? 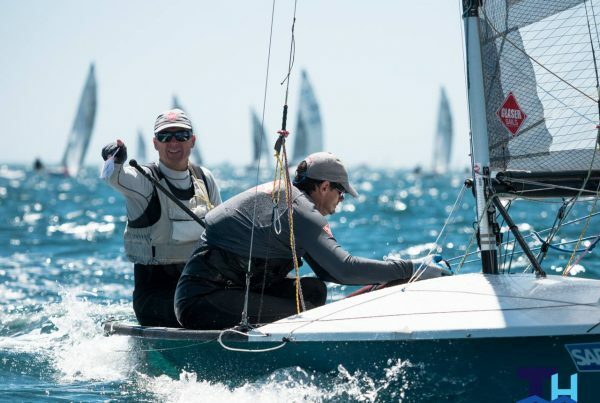 A: I am super lucky, I get to sail with the two best crews in the World, Carl and Rob. The best thing is that they now have to try and out perform the other, it is a crew game of who can be the best. So they always bring their A game. But what they both do is bring an unbelievable desire to win and laser focus to achieve that goal. I have it made there! A: Sheet in hike hard. Oh and there are no short cuts, work hard, no, work harder! But enjoy the ride. Q: On last question. How much for 9072?